The SERPs have grown leaps and bounds over the past decade. Increased PPC presence, voice search, hyper-local targeting, and machine learning are just some of the trends of the SERP’s today, and Google continues to add more and more features that provide businesses with new opportunities to become visible. With all of these changes come a myriad of marketing opportunities, specifically for SEO. 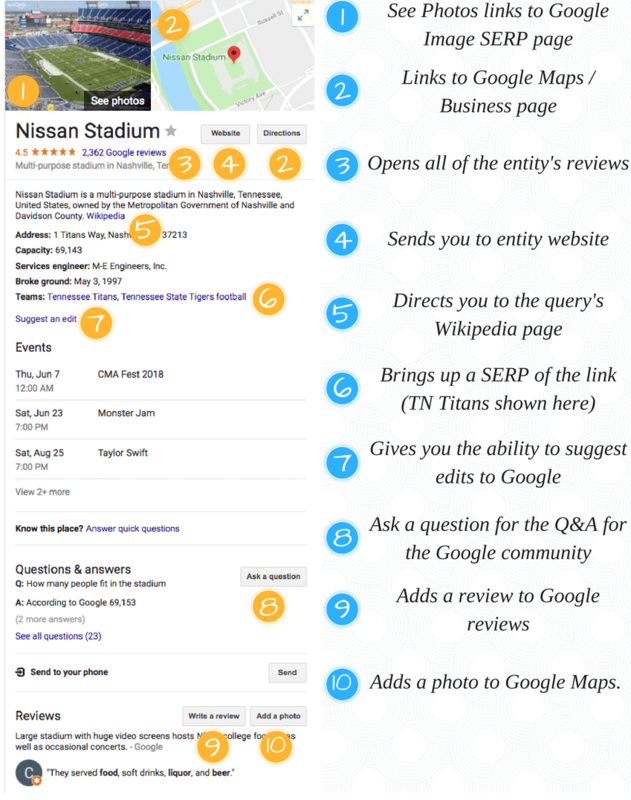 A Google Ranking Guide can never provide all of the answers, but we’ve created several sections that cover SERP features, optimization tips, and we’ve even curated some expert quotes and content for additional research. 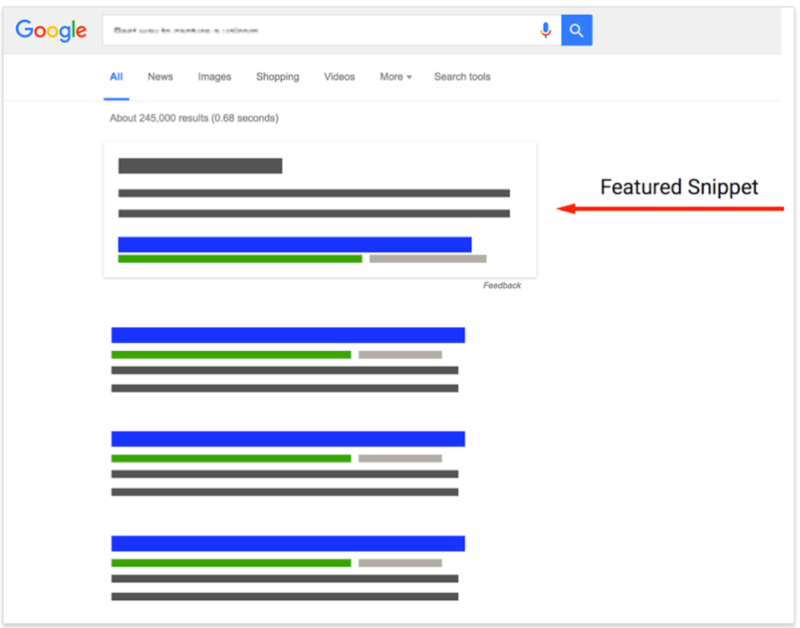 What Sites Get Featured Snippets? Additional Information: SEO Outside of the U.S. Featured Snippets are designed to give specific answers to search queries that are question-related. The featured snippet is in position 0 for SERPs, which means that it will appear above position one, and even above many advertisements. We’ve addressed in short form position 0 optimizations earlier, but this post is designed to delve much deeper into the SERP. Mobile search traffic has surpassed desktop traffic worldwide. And with the growth in voice-activated digital assistants, more people are doing voice queries. 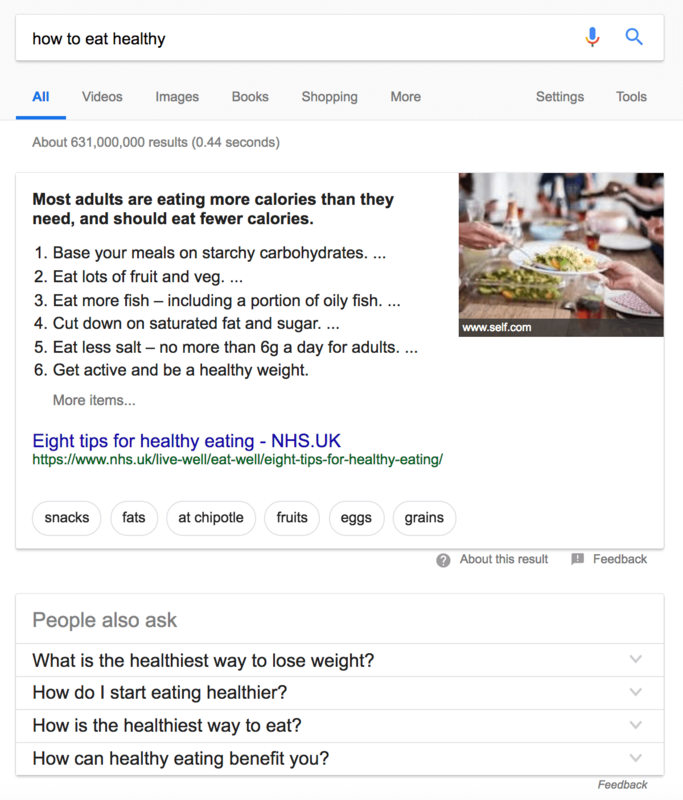 In these cases, the traditional “10 blue links” format doesn’t work as well, making featured snippets an especially useful format. The paragraph snippet includes a few lines of text along with a picture. 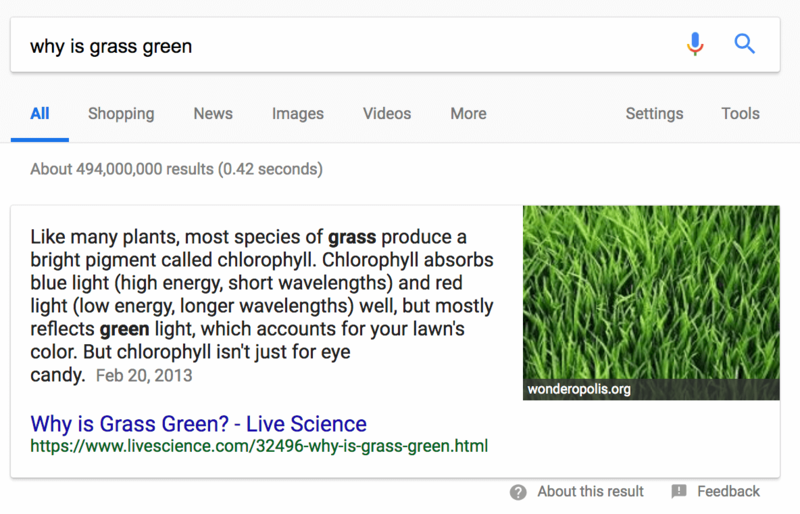 The paragraph that is featured will always have the search query terms in bold, as seen above with “grass” and “green”. The paragraph snippet will be shown whenever Google thinks that a search query can be answered quickly. The paragraph is also a way to further entice searchers to click the link if they like the featured paragraph’s information. The table snippet is created by Google when it sees a graph that answers a query. The above example is a table snippet from Statistica, which is a site that’s also ranked in the top 10 for organic traffic. As far as we can tell, the table snippet is awarded to the top 10 organic SERP results exclusively. This is not true for every featured snippet, as I’ll discuss later (spoiler: you can be on page 7 and still get a snippet). The list snippet is similar to the paragraph but it categorizes the information in short steps that can be bulleted or numbered. Video snippets can appear on a SERP among organic results when Google thinks that they aid the user. Video snippets have a title, a link, and a description just like usual snippets, but they also include a video’s thumbnail, duration, and upload time. 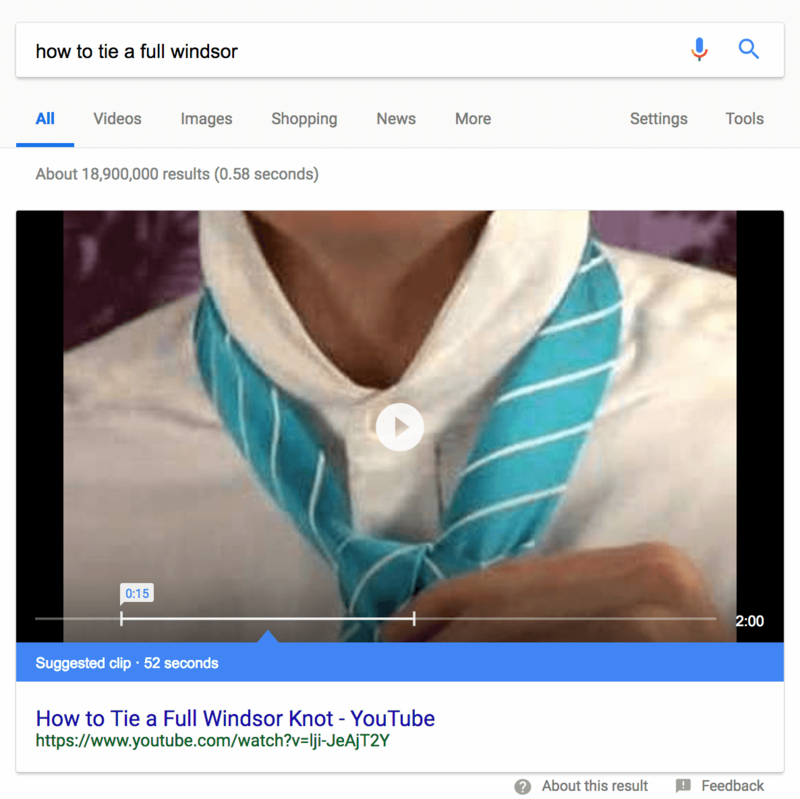 Featured Snippets are a window into how Google, as well as consumers, want you to structure your content. Here are a few suggestions for getting a rich snippet. 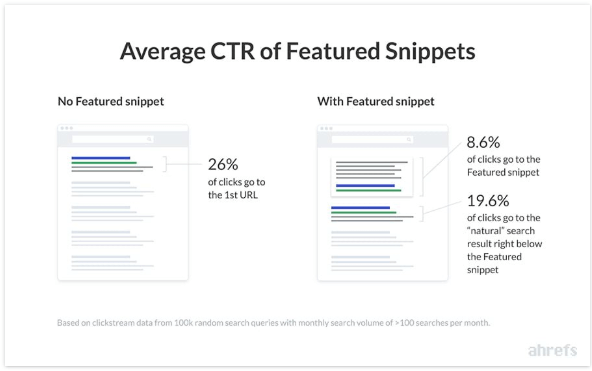 One of the secrets to optimizing a featured snippet is to provide the maximum amount of information possible while enticing the customer to read more. Strategically cut off the paragraph by taking a note from clickbait articles. The list snippet is acquired by creating a list and categorizing that list by H3’s. Interestingly enough, this is a perfect example of the importance of headers in forming a rich snippet. We recommend doing some reverse engineering when looking at rich snippets to see what they do right and potentially what you could do better. Optimizing for a video snippet isn’t terribly difficult, but as always, you need to have a proper architecture and you need to seen as authoritative. Video snippets are just about exclusively found in the DIY niche.1. Make sure to get a text version of your video. You can get a transcript extraction tool to accomplish this.2. Organize videos into small steps.3. Organize transcript into small chunks (similar to the methodology of the paragraph snippet) while optimizing with some long-tail keywords in the introduction, which you’ll paste into the description. Organize your content into short sentences and paragraphs, each having no more than 40 to 50 words. 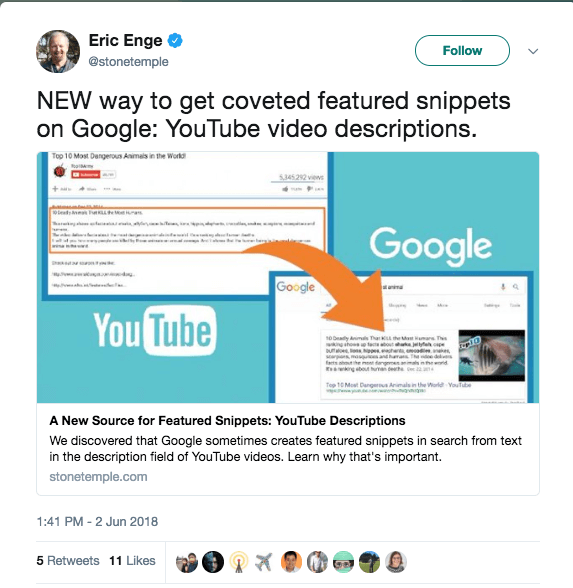 Eric Enge of Stone Temple made a great discovery on optimizing for snippets using video descriptions. This is another great opportunity for getting the coveted 0 position. 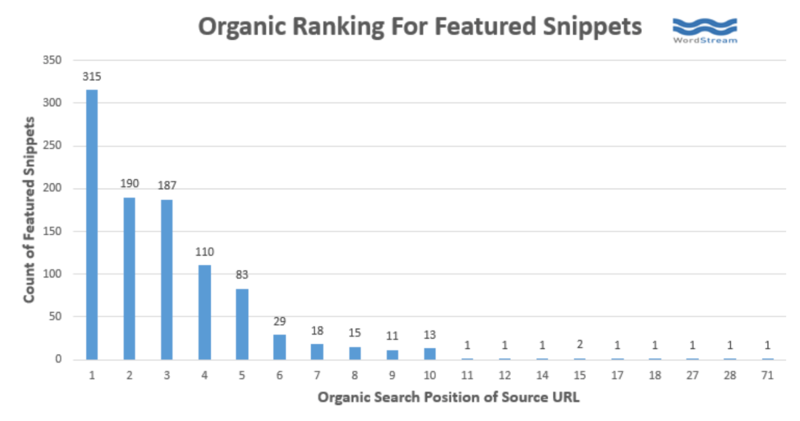 Ahrefs released a great study that actually illustrates how featured snippets affect organic search results. While featured snippets provide some new opportunities, they definitely have some side effects for traditional SEO. 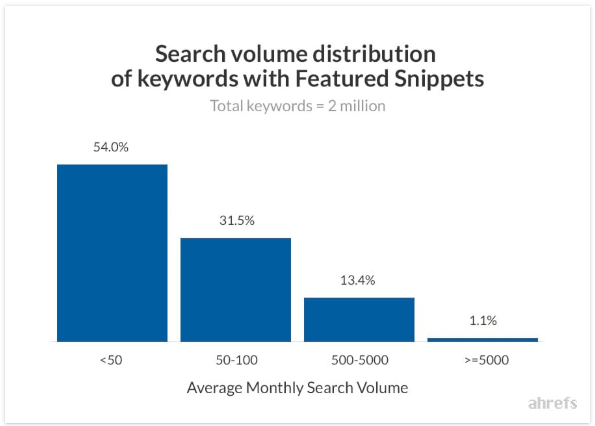 Ahrefs also discovered that long-tail keywords are much more likely to trigger featured snippets. 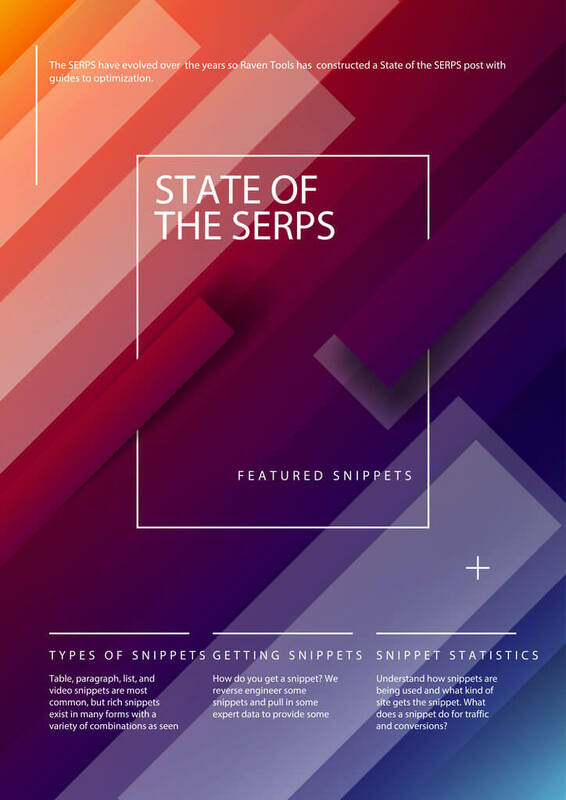 An SEMRush analysis has shown that most featured snippet result answers are between 40 to 50 words and “57% of questions have featured snippets.” 70% of all snippets are 35-50 words, which leads us to believe that this is a huge factor in determining the likelihood of snippetizing (not a real word). This information is definitely interesting, but if you are anything like us, you’re probably wondering about the typical features of snippet holders. Word Stream put together this nice little graphic that analyzes the organic ranking for featured snippets in a study of around 1,000 sites. This means that some featured snippets come from position 71! Organic rank definitely plays some factor, but other factors obviously come into play to allow positions 11-71 to claim the coveted position 0 SERP placement. 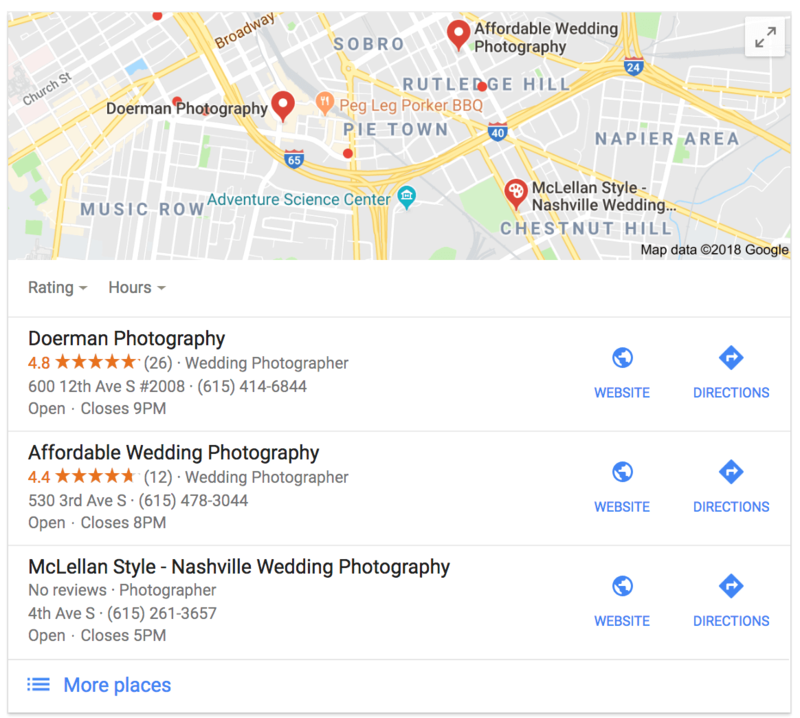 A Local 3-Pack shows up in SERPs when a query has a local intent or includes a geographical name, such as “Nashville photographer.” Google originally had 7 options but recently updated the SERP to just show 3. Cultivate reviews on your Google+ account. Receiving multiple positive reviews can be very beneficial when it comes to boosting your visibility, particularly since Google reviews and stars will be plainly visible on the 3-Pack. Make sure your listings throughout the web are accurate and consistent (link to project page about listings). Google’s Sitelinks have an essential SEO benefit that is proven to drive qualified click-through from Google SERPs to your website. This article reports that Sitelinks can increase your click-thru rate (CTR) by 64%! 1. The user gets an immediate understanding on the relevancy of the website before they click to visit. If your site is optimized properly, users can easily get an idea of the type of information you have available on your site. If it turns out they find the exact info they need from your site, from one of the Sitelinks listed below your main domain, they’ll be able to click directly to that page to get the answer they require. A simple, easy, and seamless transition for the user. I’ve audited many websites that had not ever submitted their sitemap to Google and guess what, Google rarely indexed 10% of the site’s pages and 1% of the images! An XML sitemap will help Google index your entire website, media, images, etc., and will also tell Google the most important and priority pages. It will be these pages that1 Google would chose for your Sitelinks. If you think about Sitelinks being used for the main purpose of the searcher easily being able navigating a website, you can understand how important clear navigation is for Google. Google will sometimes use your navigation hierarchy to show Sitelinks in search results. Google might take high traffic, relevant pages to show in Sitelinks. These could be pages like your “about”, “contact”, or “signup” pages. A solid internal linking strategy is part of any “good” SEO strategy. When done properly and strategically, internal links pass value and “SEO juice” from one page to another. In Google’s eyes, your most important page will have the most internal links. Following that logic, your second most relevant page with have the second most internal links according to Google. So a comprehensive internal linking strategy can possibly push Google into showing those top pages in Sitelinks. Pro Tip: You can improve the quality of your sitelinks if your SEO uses optimized anchor text and alt text that’s informative, relevant, and not “stuffed” with keywords. Be sure to use this strategy is your main navigation as well. I often see many web developers or SEOs miss this trick. Use relevant and descriptive titles for your navigation. The Google Webmaster Youtube page has a very insightful video on sitelinks that we recommend. Top Stories is a block of news articles relevant to a query. It appears in the top half of the SERP and includes time stamps and publisher names. Its incredibly difficult to be featured in this section of the SERP unless you are The New Yorker, Huffington Post, Washington Post, NPR, etc. so I won’t go into an optimization strategy for top stories. Part of the reason for this difficulty is that Top Stories is a feature of Google where they grab news stories from the most trusted sources. 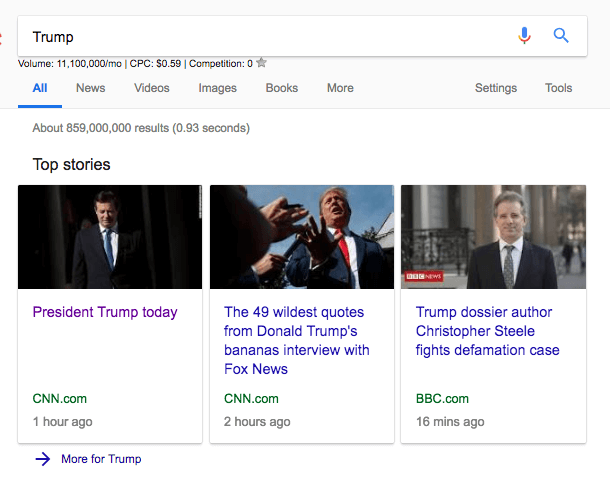 SEO optimization for Top Stories doesn’t make much sense, but you can still capitalize on PR campaigns that bring your company into the limelight in certain news outlets. If you’ve got a product or some sort of conversion goal, you can build landing pages that can appropriately make use of the PR campaign efforts. Just as with Video Snippets, Image Packs appear when Google thinks that visual content will serve for a more comprehensive results page. Yoast has a helpful article on this that goes much deeper. A couple of years back Google partnered with Twitter, and started to index tweets and started showing them in the SERPs. A pack of the most recent and trending tweets usually appears when it is somehow related to the query, like specific people, organizations or events. Optimization for tweets means that you should be tweeting as a company. Social outreach has become a massively benefical avenue for growing your organic following. Tap Clicks has an amazingly thorough guide to socials for marketers. The Knowledge graph, while different from a snippet is an informational feature native to SERPs that provides an extensive answer to a specific question. It differs from a Featured Snippet in terms of the source of information. The Knowledge Panel along with some other SERP features is powered by the Knowledge Graph – Google’s database that gathers information from a variety of trustworthy sources. Rank Ranger has a good guide on knowledge panels on their blog. An entirely separate blog could be written on this densely packed feature of Google, so I suggest reading Rank Ranger’s blog post on knowledge panels to get additional information on this SERP feature. 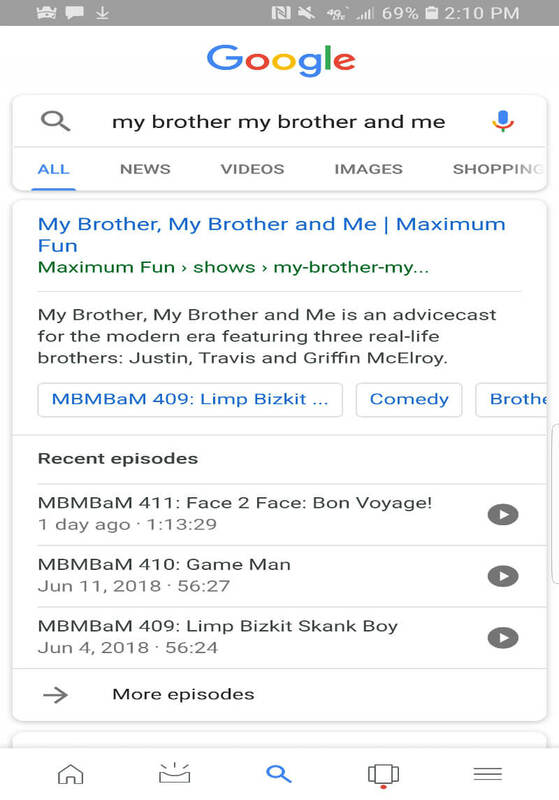 This search feature is brand new and it even has a native podcast player on search results. This specific feature adds a new layer of SEO optimization possibilities. Podcasts can now show up in snippet-type results. Google hasn’t unrolled the podcast SERP universally but it’s Chrome browsers are the only browsers that generate these types of search results. The best place (and to my knowledge the only real knowledge source) for SEO podcast knowledge is straight to google. Podcasting hasn’t quite developed from an SEO perspective as featured snippets, but podcasting is something to keep an eye on in the ever-changing SERP environment. 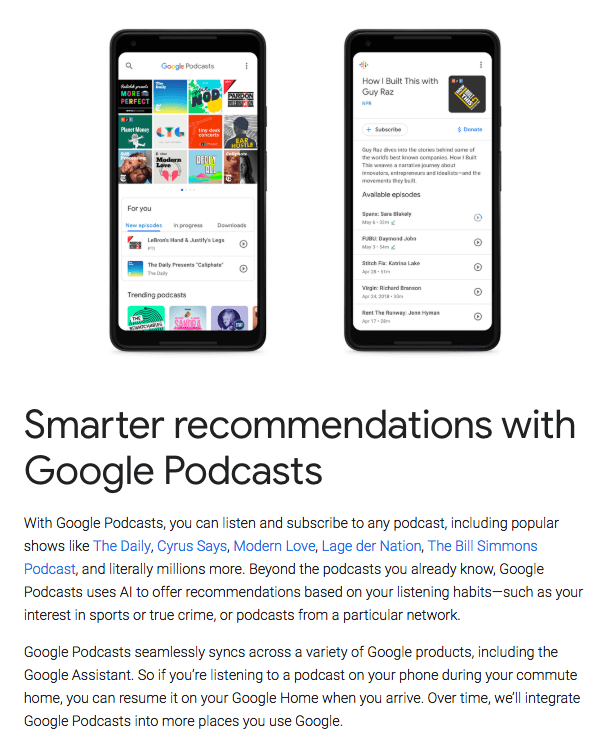 Google developers describe the new podcast SERP feature on their dev site if you’d like additional information. I’ll include one more photo from the official Google blog because I’m a huge podcast nerd. 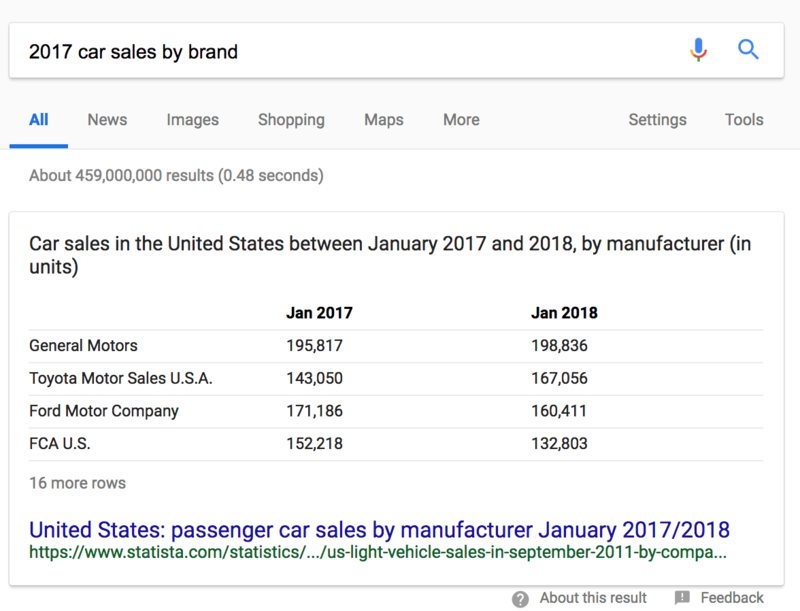 This newest SERP feature will provide a whole new range of opportunities for the SEO world and it is definitely something we plan on following as it develops. 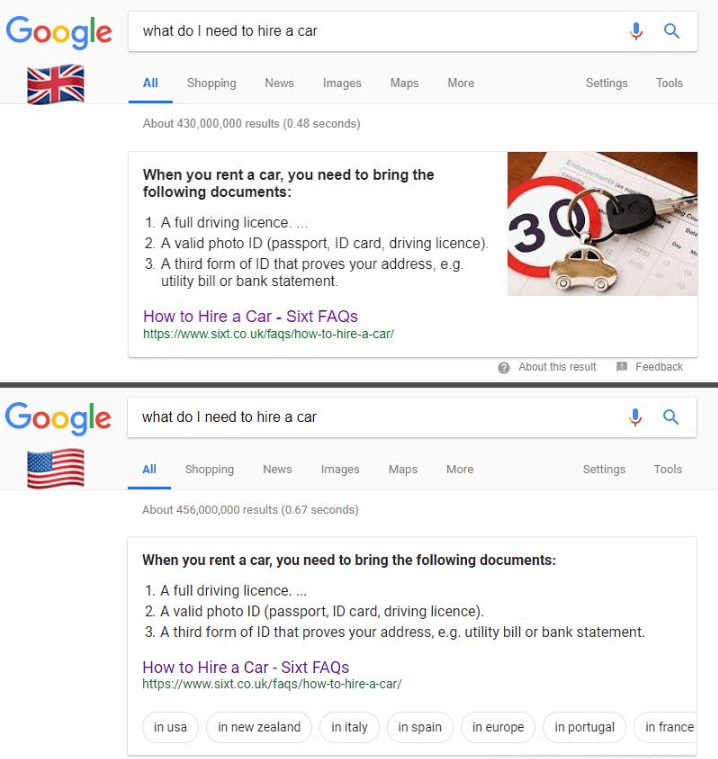 Many of these features with featured snippets are not available outside of the US, so if you are doing SEO outside of the United States, keep your eye on the update when Google brings this over. We recommend optimizing for the rich snippets earlier rather than later.